It was my eighth flight from the Williamson Sodus Airport to Oakland County International for 2018. On our previous trip, we sorted through documents, photographs, and identified those items from Mom's house that would come home with us to New York. This included two pieces of furniture with strong sentimental value for me, a grandfather clock bought by Mom when I was a kid and my grandfather's antique desk. Our goal for this trip was to transport these things back to New York. A secondary goal was to accept Judy's offer of a visit to the farm. I had every confidence that Judy would be an excellent adoptive mother for Maggie and Dougall, but wanted to see so for myself. Besides, The Bear and I did not get a proper goodbye with Dougall a week prior because he was confined to his pet carrier for the entire time we spent with him. Rather then spend time driving a truck from New York to Michigan, resulting in a late Friday night arrival well past The Bear's bedtime, we chose to fly in and rent a van for one-way transport of the furniture. This meant that, while The Bear and I would fly home, Kristy would be driving the van solo to New York. While it all made tremendous logistical sense, I am pretty sure that I got the best end of this deal. According to routine, Scott parked us at Michigan Aviation. "Do you ever leave?" I asked him. With Mom's Subaru parked just tens of feet from transient aircraft parking, we were on our way to a late dinner in Clarkston within minutes of arrival. Breakfast the next morning was at the Old Village Cafe in downtown Clarkston. I do not habitually lavish superlatives on my hometown, but this is probably my favorite breakfast diner anywhere. I ate there so frequently this summer that the staff recognize me when I walk in.That is a weird feeling considering that I have not actually lived in town since 1991. Walking back to Mom's, we stopped at Honcho to get coffee for Kristy. While we waited, I explained that the hip new restaurant used to be Morgan's Marathon gas station. It was where I used to have my college car repaired, work that would take place right about where we sat waiting for coffee. Later that day, we picked up the Dodge Grand Caravan that would carry everything back to New York. Though she agreed to drive the one-way trip, Kristy had balked at the idea of driving a U-Haul truck for so many hours. The Grand Caravan was more comfortable for her to drive, but also required more creative packing to fit everything inside. Unfortunately, the nearest Grand Caravan available though Enterprise was in a sketchy part of downtown Detroit. Pickup made for an interesting excursion. On the positive side, it was my first time driving on The Lodge, so now I feel like a real native of metro Detroit. 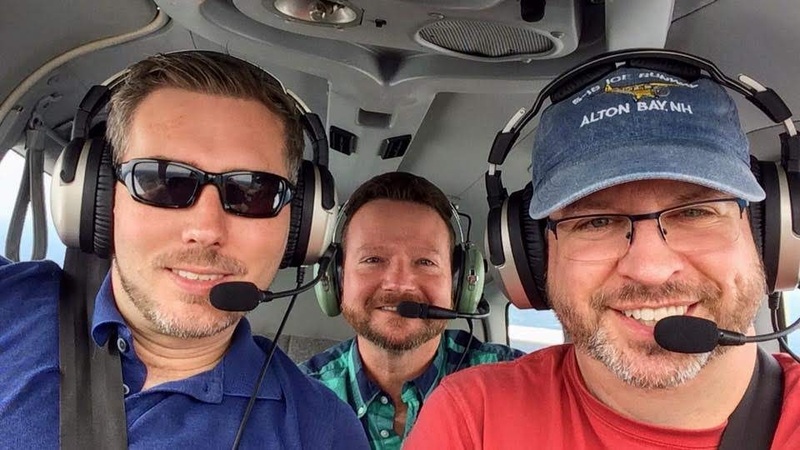 With Chad and Ken during a quick flight out of Oakland County on 8 Sep 2018. My friend Ken from high school, an expert in grandfather clock repair, helped me prep the clock for shipment. He loaned me a pendulum box, a box for the weights, and a cardboard retainer for the chimes. With his expert assistance, we not only moved the clock safely to New York, but got it running again in short order. On Sunday morning, Pam and Stephen helped us pack the van carefully. It took us over an hour to fit everything inside to our satisfaction and we used all the available space from deck to ceiling. Kristy rolled out of the driveway at noon on Sunday for an eight hour drive to Rochester, NY. While Kristy was driving south toward Ohio, The Bear and I drove north to Judy's farm to visit Dougall and Maggie. We brought some additional pet carriers and supplies from Mom's as donations to the cause. I think that Dougall was glad to see us. Maggie was never far from his side. We watched them both happily trot around within the enclosed yard. They had other friends to play with and even a pony in an adjacent pasture to harass. Judy's farm looked like puppy paradise to me. I know that The Bear would have been thrilled for Dougall to live with us, but our current lifestyle is not amenable to caring for a dog; we struggle with leaving the cat alone for long periods of time as it is. If he was doing poorly in Boston, that seems to have turned around. He now has a good home, lots of attention, the comfort of an old friend, and a safe place to run free. Those are not things that we could have offered Dougall or any of Mom's dogs. We departed content in the knowledge that Dougall was a happy fellow. At 9,000 feet, The Bear and I slalomed around cloud build-ups over Canada on the way to Sodus. We were targeting an 8:00 pm arrival at home to meet Kristy with the van. There may have been some goofiness at 9,000 feet. Early onset hypoxia? As she observed the Garmin 430 sequence to the leg from AXOBU to HAVOK along our IFR route, The Bear mused, "Too bad the previous place wasn't WREAK." Clearly, it was a lost opportunity. Sometimes, the FAA shows a definite sense of humor in naming waypoints, such as those along the GPS instrument approach for runway 16 at Portsmouth, NH: ITAWT - ITAWA - PUDYE - TTATT with a missed approach fix of IDEED. We navigated around a small thunderstorm near London, Ontario. After years of deviating around thunderstorms over London, even in my VFR-only days, I had to wonder why it is such a nexus for convective weather. A rainbow took shape in diffuse mist drifting downwind from the thunderstorm. It was the only sight along the way that significantly pulled The Bear's attention away from her iPad. We landed at Sodus near dusk and managed to beat Kristy home by ten minutes. Mission accomplished and accomplished well! That night, the grandfather clock was ticking away contentedly in our living room. Most importantly, I ended the weekend with the knowledge that we had absolutely done right by Dougall. All four of Mom's dogs were important, of course, but Dougall was special. He was special to Mom and he was special to us. Seeing his happy doggie face in his wonderful new home was more soothing to my heart than I can possibly express in words.